Viet Tiep Lock Joint Stock Company initially was Hanoi Lock business directly under the Hanoi Department of Industry; being established under Decision No. 223/CN dated 17/07/1974 of the Hanoi Administrative Committees with a design capacity of 1.0 million locks/year equipped with all equipments of the former Czechoslovakia and began its official operation from 7/1976. Hanoi Lock Business changed name to Viet Tiep Lock Business under Decision No. 2842 /QD-UB dated 11/16/1992 of the Hanoi People's Committee. Viet Tiep Lock Business was adjusted tasks and renamed Viet Tiep Lock Company under Decision No. 2006 / QD-UB dated 09.13.1994 of Hanoi People's Committee. Implementing Decree No. 187/2004/ND - CP dated 16/11/2004 on transformation of state companies into joint-stock company and Desision No. 2674 dated 6/5/20085 of Hanoi People's Committee on allowing Viet Tiep Lock company to be equitized, after one year of successful equitisation, Hanoi People's Committee issued Decision No. 1946 / QD - UBDN dated 24/4/2006 on transformation of Viet Tiep Lock state owned company into Viet Tiep Lock Joint Stock Company. Vietnam Joint Stock Company had business registration and officially came into operation since the date of 17/05/2006. ♦ Period 1976 - 1986: Name: Hanoi Lock Business, a state-owned business operating under the centralized planning mechanism having state subsidies, the highest production volume reached only of 40% of design capacity. - Products manufactured was 400,000 locks. - The value of industrial production was 2.26 million. - Budget's submittion was 0.23 million. - Workforce included 272 people. ♦ Period 1986 - 1990: This was the extremely difficult period for state owned enterprise in general and Hanoi Lock Enterprises in particular. Those enterprises was not used to switching to the new mechanism. They had to be responsible for everything from input to output without subsidization from the State. - The value of industrial production was 1.398 billion Dong, an increase of 115 times in comparision with that in 1986. - Revenue was 1.019 billion Dong, an increase of 55 times compared to that of 1986. - Budget's submittion was 74.5 million Dong, an increase of 46 times compared to that of 1986. - The Company has completed its obligations towards the State. ♦ Period 1991 - 1994: This was a challenging period with the competitors in the market mechanism. The main innovation in the way of thinking and acting, promoting the common energy as well as promoting the creative dynamism of each employees created the stability and development of the company. 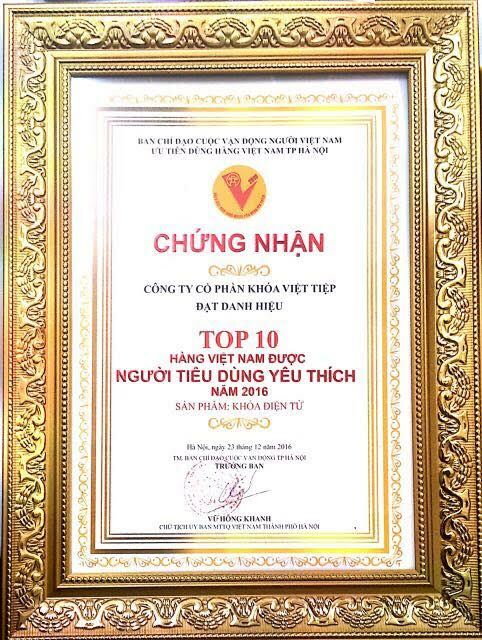 In September 1992, Hanoi People's Committee decided to rename the company to Viet Tiep Lock Business; Viet Tiep Lock trade mark have had gradually prestigious in both domestic and foreign markets; and was awarded the third-class Labor Medal. - Production reached 1 million locks, (equipvalent to 100% design capacity). - Revenue was 9.0 billion Dong (equivalent to 9 times more than that in 1990). - Budget's submittion of nearly 500 million Dong, (equivalent to 6.5 times compared to that of 1990). - Average income of over 400,000 Dong person/month (equivalent to 6.1 times compared to that of 1990). - Production reached 4 million locks (equivalent to 4 times the design capacity and 12.9 times compared to that in 1990). - The value of industrial production reached 42.5 billion Dong (equivalent to 30.4 times compared to 1990). 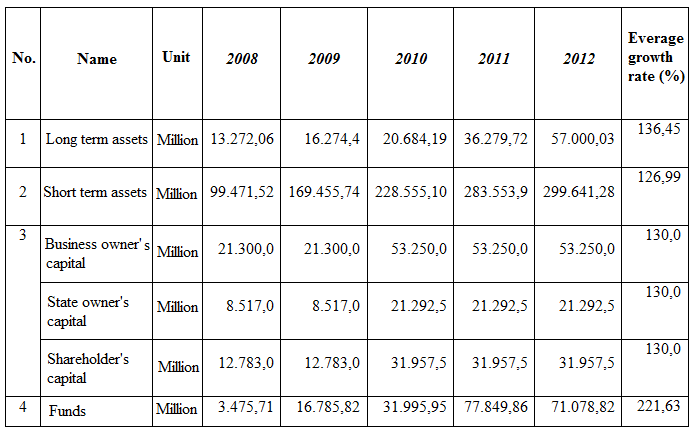 - Revenue reached 52.4 billion Dong (equivalent to 51.4 times compared to 1990). - Budget's submittion reached 3 billion Dong (equivalent to 40.4 times compared to 1990). - Attracting more than 276 employees compared to that in 1990. - The average income of over 1.0 million Dong/person /month. ♦ Period 2001 - 2002: Viet Tiep Lock Company completed successfully the socio-economic indicators given by the Party and State with an average growth of 20-25% / year. The company was awarded the first - class Labor Medal. ♦ Period 2003 - 2007: The company inherited the experiences of 30 years in producing lock (1974-2004), this was a very developing and stable period with the average growth increased by 10 - 15% year by year. Especially,the year 2003 was the important remark for the company to be the official member of the business club having production value of over 100 billion. Since 2005 - 2007, the Company had carried out political tasks given by the Party and State and conducted equitisation successfully under Decree No. 187/2004/ND-CP dated 16/11/2004 on the transformation of State companies into joint-stock companies. 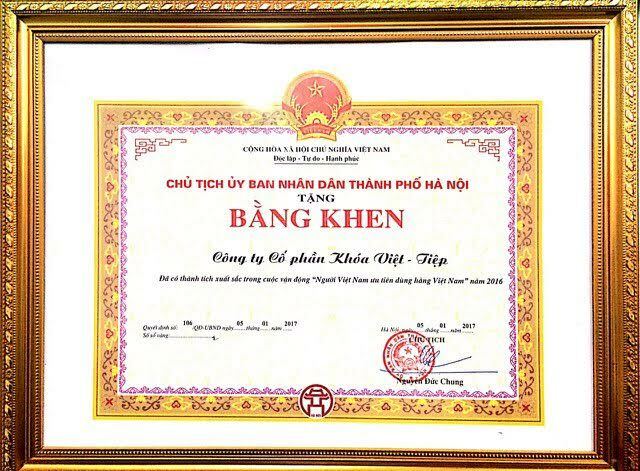 Viet Tiep Lock Company transformed into Viet Tiep Lock Joint Stock Company with the business registration and officially went into operation under business law since 17.05.2006. ♦ Stage 2008 - 2012: As the economic crisis happened continuously but the company maintained full operation and ensured 100% works for employees, no leaving case because of lacking of works; the annual average growth rate of the company from 10 to 15% guaranting income for workers increased from 4.2 million/person/month in 2008 to 5.2 million/person in 2012; higher submittion for the nation's budget year by year. Especially, in 2011, Viet Tiep Lock became the official member of above 500 billion revanue and industrial production business club. Vietnam-Czechoslovakia in 2011 Courses are among the official club business value of industrial production and sales of over 500 billion. - In 2014, Viet-Tiep Lock JSC., received the "Second class - Independent Medal". The company applies a quality management system in accordance with "ISO 9000-2008" standard, applies KAIZEN/5S to avoid waste and improve operational efficiency of the company. 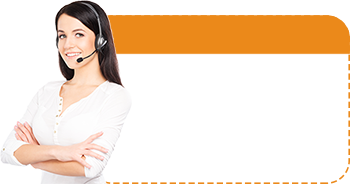 The company maintaines stable employment for all staffs, annual average growth rate of 7- 15% guaranting avergage income for workers is 6.4 million/person / month in 2014 .